The gamified design thinking apprach for DesignIt was developed together with the students from Metropolia. First phase was the kick off meeting. Members of the project described how they understood the topic of design thinking and what the goal should be for the serious game. After which, we discussed what kind of constraints, values and gaps there might be in creating such a game for students and teachers (see e.g. Tran 2017 and IDEO 2013). The session of discussion amounted into two documents drafting the potential idea of the game to be created – a draft concept of the game. Second phase consisted on detecting gaps and constraints we had found in the phase one and which needed further investigation. We could have used the Data Canvas (number 3 in lean service creation: https://www.leanservicecreation.com/canvases) from Futurice to document our gaps and what data we have and miss. However, we had strong consensus of the data needed. Thus, we proceeded directly to the field study for gaining information on students needs. We executed short (10-15 min) interviews with 24 students for understanding their attitudes towards different kinds of games and needs on how to support design thinking in the early phases. We selected users by their availability but more importantly we attempted to interviews those students who belong to the extremes – they play game a lot or they do not play games at all (see Futurice Lean Services and Tran 2017). Our previous experiences showed that early phases where the most critical. The outcomes were categorised to reveal what kind of game would be good from students’ perspective. The game they preferred was something that supports, guides and provides feedback for them. It allows completing tasks that are needed and go forward in their team projects. They (20 of 24) preferred mobile games to simulation games, especially over desktop simulation games. Students who had played serious simulation games did not have positive experiences (note this might be one reason why these particular students did not want a simulation game), since “the things did not stay in the mind”, and “it felt useless”. The actions executed in the phase 2 conform to IDEO approach of phase one, step two (Prepare Research: Select Research Participants, Prepare For Fieldwork (IDEO 2013:29). In the Third phase, a new workshop and brainstorming session was organised with teachers for organising information acquired in the interviews and to further design the game in selected courses at Metropolia UAS. Participants got acquainted with the material and organised it, draw sketches of the potential flow of the game and polished the drafts so that they could be used as tangible material in workshop with students. While working on the game idea and flow of the game, it was noticed the game features were described but not the gamified aspects of the game. Thus, we needed a workshop where we could acquire insights on what kind of gamified features and functions students see worthwhile and engaging. Before starting the workshop design, we wanted to visit a workshop organised by Futurice to get inspiration on how the companies execute design thinking (see the guidelines provided by IDEO 2013:29 in using design thinking especially the phase 1 and step two prepare research: identify sources of inspiration, e.g. by learning from experts). This phase also complies with the iterative and collaborative work processes for knowledge creation (see Paavola & Hakkarainen 2014, Seitamaa-Hakkarainen & Hakkarainen 2001). Learning together the issues that are known in the designed topic is one of the important aspects of design thinking (Hassi, Paju & Maila 2015). 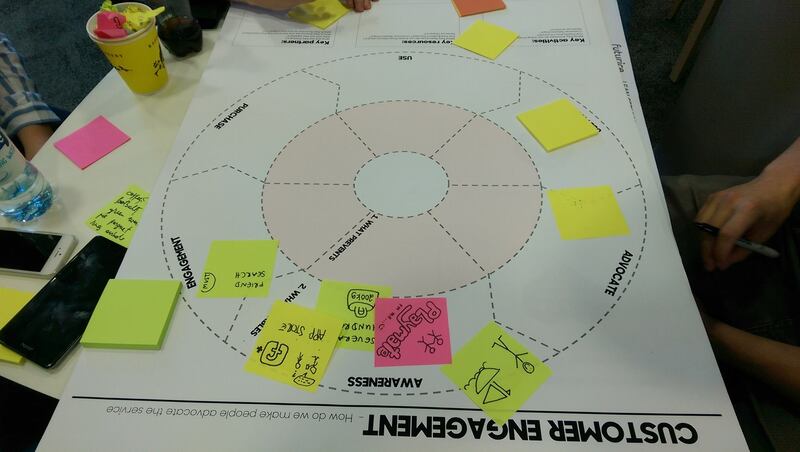 Fourth phase consisted on getting inspired by participating a workshop organised by Futurice. Futurice is a design company who provides design thinking, service and application design. Futurice has offices in Helsinki, Berlin, London, Tampere, Stockholm and Munich. It was founded in 2000, has 400+ employees from 22 countries. In last 8th years the profitable growth – Year Over Year growth is 30%. In the workshop, the early phases of design thinking were covered using various lean service creation canvases (Sarvas, Nevalinna & Pesonen 2017). The workshop presented the current methods and tools creative companies use. We also learned that the future direction is increasingly towards lean service creation with design thinking attitude. The future direction, tools and methods adhere to what other companies such as Gofore exercise. Gofore is situated in Helsinki, Jyväskylä, Tampere, Munich and Swansea. It was founded 2002, has 350+ customers. Both companies are potentially willing to validate the game developed in the DesignIT project from business perspective – how accurately it represents their working methods, and would they see students learning essential skills when using the game. Based on what we learned in the workshop, we planned a workshop for students to contribute to the game design, especially in designing the gamified aspects of the game. Fifth phase consisted of planning and executing the workshop, organising workshop results and communicating these to the project. The workshop was organised in similar manner than the one we took part in Futurice. Two student teams (4 team members per team) were selected to take part in the workshop. The teams were randomly selected. The workshop had the flow of the game (see phase 3) drawn in black board and printed in an A3 canvas. 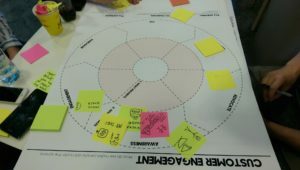 The black board presentation had, in appropriate places of the game flow, the lean service creation canvases that were planned to be used in the course. The canvases used were: Canvas 3 (Data) in data collection, Canvas 5 (Insight), Canvas 6 (Ideation), Canvas 7 (Concept and value proposition), Canvas 8 (Profiling concept) in ideation, designing the concept and Canvas 9 (Fake advertisement) and Canvas 10 (Validation) in validation. Students were explained the flow of the game and that we would like them to comment the flow and especially invent game features that they think would help them to be engaged and learn. The students were asked to use post-its for describing the game elements and other ideas/comments and place them to the backboard into the spot where they thought the elements should be. Briefing and asking clarifying question was executed on the spot in the workshop. We did not want to keep the students too long away from their courses, which a separate briefing would have demanded. Two teacher researchers were guiding the workshop and collecting the data. Notes and photos were taken as well as sample audio recordings of the lengthier discussions between students. The workshop setting was similar to IDEO, design thinking for educators: learn from users (2013:35) settings are. However, we attempted to go beyond learning from users by engaging users so that the users would design elements for us. We paid attention to such issues as: enabling users’ physical movement, providing tangible objects and actions as well as easy pointing, namely, to easily use indices. These issues help sharing of ideas and understanding each other, which enables successful workshop (Bauters 2017). The data, namely, post-it comments were collected and categorised into the game flow. The categories emerging from the data are: discard (these comments were going beyond the current game), general (these comments were the game rules/components out of which the game structure forms), fieldwork reviews (components how to execute the peer review of field work items) and reviews of canvases as well as providing points for the validation canvas. Together when similar comments have been merged, we received 31 ideas how to gamify the design thinking early processes of scoping, learning in the field, analysing field results, ideation and validation of concept. Provide certain amount of points in the start of the game so that these can be used in the game. Points can be used to buy ideas, expert opinion, support etc. Create a problem log in which problems of the idea/challenge are listed. Points provided by amount of found problems and how many were solved. Knowing order of teams, but not the exact score (who is in front of you). Some canvases are forced to be used, while others can be selected by the team. Rankings based on the reviews, some parts can go bad, some go good. Feedback needs to say how things are good. Using social media to promote idea and validate it, would give additional points. Finding sponsors or potential partners gives extra points. Fake advertisement canvas judged by other teams – order excluding your own canvas. Extra points of making a reflection as extra argumentation of the validation part. The next phases would be narrative description of the game and storyboard of the game, which we aim to validate with students. Then we proceed for low fidelity prototypes (see e.g. Tran 2017).